Posted December 26th, 2013 by Lisa & filed under 12 Divine Holiday Treats, chocolate, Christmas, coffee, Divine Chocolate. Friends, it’s hard to believe, but we are nearing the end of the 12 “Divine” Holiday Treats journey. Christmas is over (I hope Santa was good to all of you! ), and while you’re busy running to the mall to return some of your not-so-favorite-gifts and preparing to celebrate New Year’s, TRB is proud to bring you a recipe for a quick and easy cake. This is not just any cake, mind you, it’s the Big Quick Cake. As the name suggests, it’s so simple to prepare, you can muster up enough energy to do so — even in the midst of all of the holiday festivities. I’ll admit, I took quite a few liberties with this recipe. 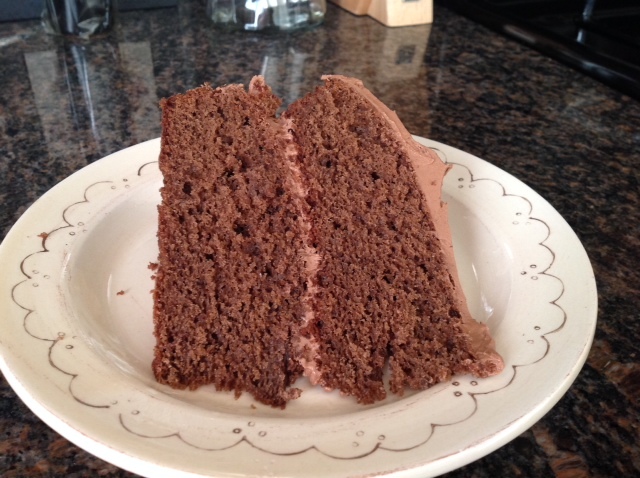 When I thought of a “Big Quick Cake,” I envisioned a scrumptious, but unpretentious dessert. A cake with thick and fluffy frosting — just enough to spread in between the layers to envelop the rich chocolate cake with decadent coffee sweetness. A cake that would look impressive enough on a serving platter, but not be too intimidating to cut. Instead of a springform tin, I greased and floured two 9-inch round pans. I also added a heaping tablespoon of vanilla to the cake. 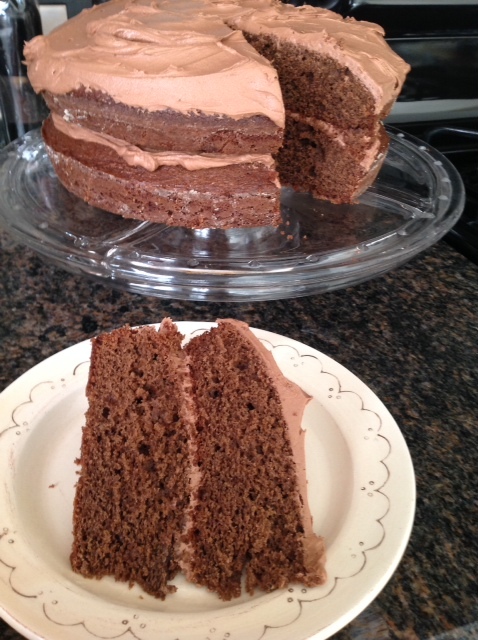 (I recommend adding 1 cup of sour cream to the batter — it will yield a more moist and delicious chocolate cake. Of course, I thought of this *after* I pulled the cakes out of the oven!) 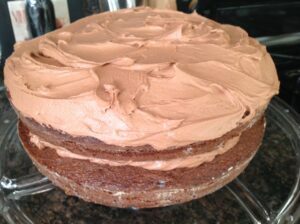 And, I adjusted the frosting recipe slightly to yield a more fluffy consistency. The Big Quick Cake is perfect for entertaining and can be made the morning of your gathering. I suggest serving big slices. After all, there’s no need to count calories until January. 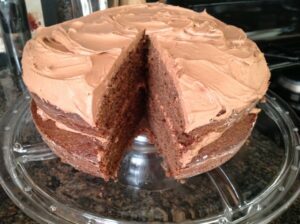 Makes a large cake; 8 large slices or 16 small slices. 1. Preheat oven to 350 degrees. Grease and flour two 9-inch round cake pans. Make the cake: Beat the butter with the sugar until light and fluffy. Add eggs, one at at time, and mix well to incorporate. Add vanilla extract and cocoa powder, and stir to combine. Mix in flour, baking powder, salt and sour cream (if using). Bake the cakes for 25-30 minutes or until a toothpick inserted into the center comes out clean. 2. Make the frosting: Melt the chocolate. Mix with softened butter, add cocoa powder and vanilla and stir to combine. Add powdered sugar and whisk to yield a fluffy consistency. (If the frosting is too thick, add a tablespoon of milk. If too thin, add a little more powdered sugar). 3. Place the first cake on a serving platter. Top with half of the frosting. Layer with second cake and remaining frosting. Slice and serve. Enjoy!